ADLINK Technology has introduced a robust and reliable IIoT-ready combination embedded controller and IoT gateway. The company’s MXE-210 offers a small footprint and is fully operable in harsh environments from -40C to 85C, making it an excellent choice for transportation, industrial automation, agriculture/aquaculture, and smart city applications. Functioning as both an embedded controller and gateway, the device bridges the gap between OT and IT data interchanges. 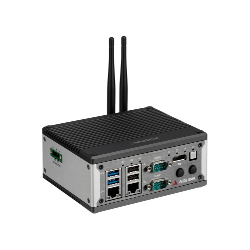 It gives supports for third-party producers via its broad range of industry standard compliances; support is included for EtherCAT, Modbus, MQTT, DDS, and CANOpen by Vortex Edge Connect, as well as Wi-Fi, BT, LoRa, 3G, and 4G LTE for data communication and wireless connectivity. As a controller, the device leverages the same protocols to directly communicate with and control any standard industrial device.